When you woke up this morning, did you remember to say “white rabbits”? In the English-speaking world, there is a long-held tradition of saying “white rabbits” or “rabbit rabbit rabbit” on the first day of the month to guarantee good luck for the rest of the month. Notable figures such as US President Franklin D. Roosevelt are even said to have observed the superstition. The roots of this particular saying are shrouded in mystery, but it’s just one of many different meanings that have been ascribed to the rabbit in different cultures across the globe. Here are a few of our favourites. Lucky charm: There are many other examples of rabbits symbolising good fortune. Carrying a “rabbit’s foot” as a lucky charm is a practice found all over the world, dating back to 600 B.C. Meanwhile, the Aztecs believed in a pantheon of 400 rabbit gods who held wild parties and are said to be the gods of drunkenness! Not a happy bunny: It’s not all been plain sailing for rabbits, though. For many years, sailors refused to utter the word “rabbit” on their boats lest they come to harm at sea. Meanwhile, on the Isle of Portland in Dorset, rabbits are considered to be highly unlucky. Some older residents call them “underground mutton” to avoid saying the word! What’s up, Doc? In American popular culture, rabbits are often depicted as sneaky and cunning – think Bugs Bunny and his exploits. It’s thought that the figure of the rabbit as a trickster has its roots in African folklore, where cunning rabbits featured in many entertaining moral tales. 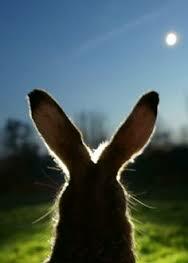 Moon rabbit: In many cultures, there isn’t a man in the moon – there’s a rabbit! The bunny-shaped shadows on the lunar surface have given rise to rabbit mythologies across the globe. In China, the “moon rabbit” is believed to be holding the elixir of life, while according to Japanese traditions, it’s making sticky rice cakes with a pestle and mortar. This connection with the lunar cycle is one reason why rabbits are strongly connected with fertility – that, and their extraordinary breeding capabilities! A spring in their step: In many cultures, rabbits are associated with innocence, youth, and new life, embodied by the character of the Easter Bunny, a springtime favourite commonly found in Western cultures. But this isn’t true everywhere: in Australia, rabbits are considered to be overbreeding pests who destroy crops, and the Easter Bunny has been replaced there with the “Easter Bilby”, a more popular species. When localising content for international markets, understanding the symbolism behind your branding is a real lucky charm. Etymax offers translation and localisation services with an in-depth knowledge of local cultural concepts. In every language.